Because it is important for a school newspaper to cover all of the clubs and activities a middle or high school offers, this FREE Beat Sheet presents a succinct way for journalism students to find story ideas they can develop. Sometimes the info is quite brief, i.e. an announcement of up-coming events, so it is summarized in a column set aside for that purpose. Other times, the information sparks ideas for a news or feature piece. 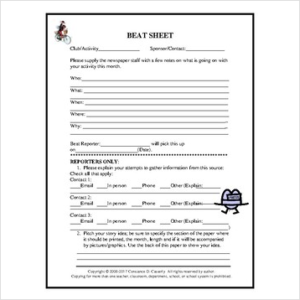 The Beat Sheet is an excellent way for newspaper staffs to find ideas and to plan for the next issue. Also, it offers first year students a chance to write for the paper, insuring their desire to remain a part of the journalism scene throughout their high school careers.